In the Google Play store, install the app by tapping the rectangle that says “Install.” You can open it by tapping the icon (a little blue box with two figures on a road) on your phone or tablet’s home screen. Then just follow the app’s instructions for how to pray! The community has released a new personal prayer app with easy to follow instructions to lead you step by step through meditations on Scripture passages about Jesus’ life. 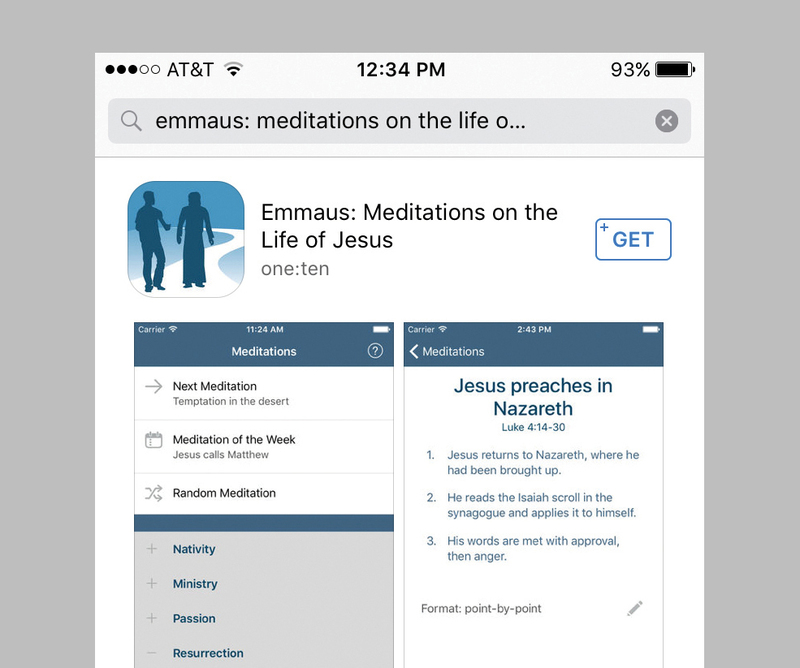 The app, called “Emmaus: Meditations on the Life of Jesus,” is free and can be used on your iPhone, your iPad or your Android smartphone or tablet. The app includes the relevant Scripture Passages from the English Standard Version, so you don’t need anything other than your phone to pray. Even if you’ve never done a meditation before and don’t know anything about it, you can follow the app’s simple instructions to use this method of prayer. The app contains the full text of the scriptural meditations developed by Craig Lent in 2008. In fact, Craig was the visionary and the driving force behind the creation of the app, which was requested and funded by the People of Praise and developed by one:ten communications. You don’t need anything other than the app to begin praying this way, but if you’d like more information and instruction on doing meditations you can watch or listen to Craig’s talks from the 2009 PTI. To find them, visit the online File Library at peopleofpraise.org/file-library/44 and log in. 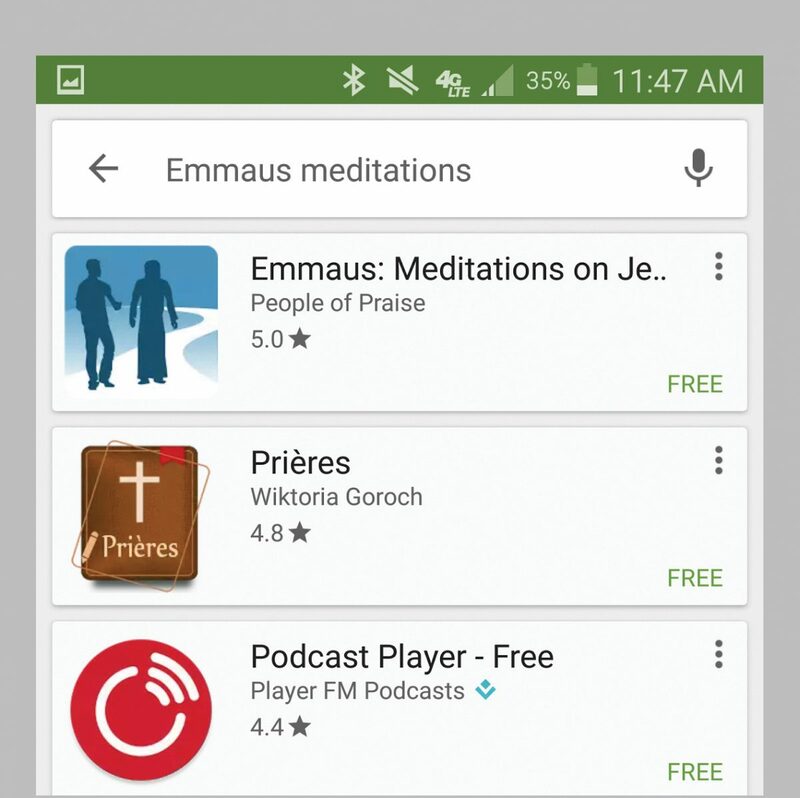 If you have an Android phone or tablet, you can find the app by searching for “Emmaus meditations” in the Google Play Store. On a recent Tuesday in a gas station parking lot between my office and an evening headship meeting, I pulled in under a tree, rolled down the windows and swiped my phone on. I set a timer, read a Scripture passage and spent an hour placing myself in the scene as Jesus called Matthew the tax collector to follow him. 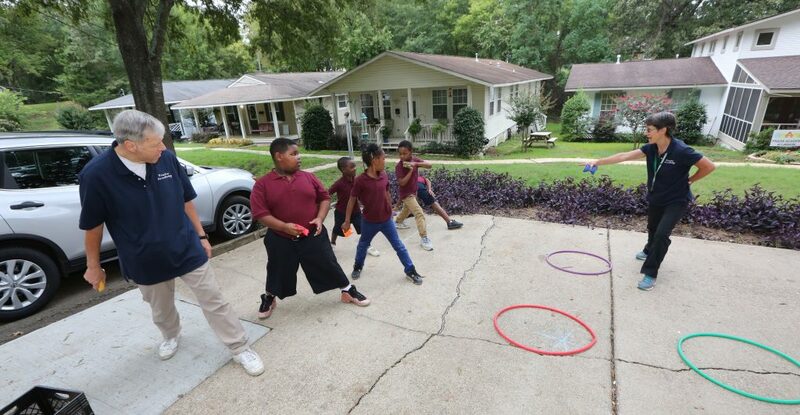 I imagined servants pouring wine into the cups of partying guests at Matthew’s home as Jesus ate with Matthew’s friends, the town’s sinners and tax collectors. Then I had a conversation with the Lord about how he walked right into Matthew’s life, and how I might engage with the lives of the people I meet at work. I hadn’t planned to do a meditation that day, and I didn’t have my Bible with me. All I needed was my phone. The first thing I noticed when I opened the app was the set of options it offers for choosing a meditation. You can choose “Next Meditation”–the app will keep track of the last meditation you did, and suggest the next one sequentially. There’s also a “Meditation of the Week,” which loosely corresponds to the liturgical season and will be the same for every user. This could come in handy for doing a meditation with your men’s or women’s group. You can also choose “Random Meditation.” Then just shake your phone, and the app will spontaneously select a meditation for you. The app’s home screen is your tool to help move along through the app. You can choose meditations on Jesus’ life by chronological theme (below: nativity, ministry, passion, etc.). You can also choose systematically (“Next Meditation,” or “Meditation of the Week,” both of which follow the chronological list from above) or use the “Random” option. Once you choose a meditation, you are presented with the scriptural points to be considered. 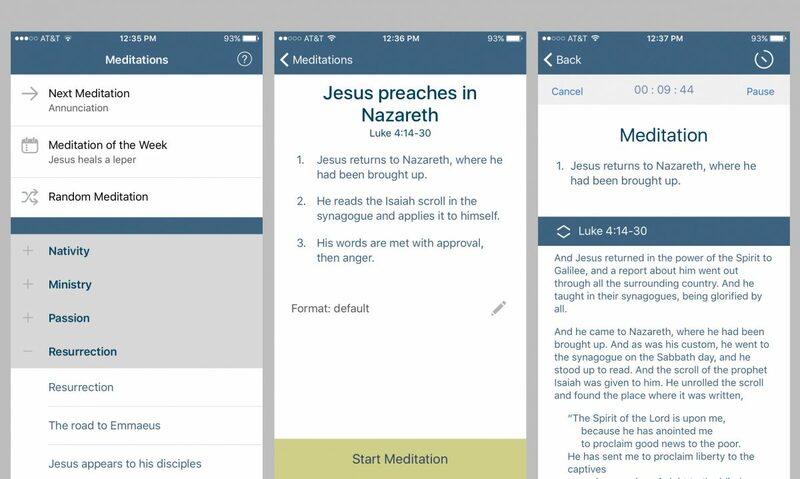 The app contains the full text of the relevant Scripture passage for each meditation, so you don’t need to have your Bible with you. There are plenty of other flexible settings in the app that allow you to personalize your experience, which was what I liked the best about it. Although the instructions provide suggested times for each step, you can set the timer for any number of minutes, and the app will use your device’s notification settings to let you know when the time is up. I always have my phone notifications set to vibrate so that it doesn’t make noise every time I get an email, and I found that helpful. For me, a vibration is subtle enough to be aware of, but I can choose to ignore it if I want to stay with a particular point a bit longer. There are also options for formatting the text of the meditation and instructions. You can look at one point at a time, see the whole meditation on one screen or choose an option in-between. 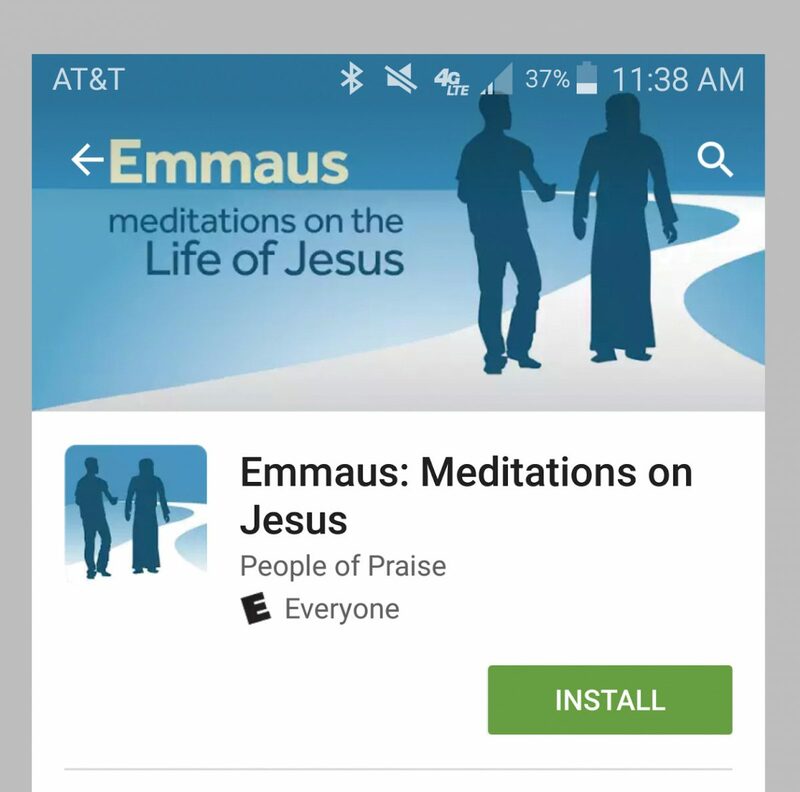 You can download the free Emmaus app from Apple’s App Store or the Google Play Store. Visit peopleofpraise.org/apps for more information and direct links to install the app on your device.